I was standing in pit lane at Lime Rock Park with a BMW E30 M3, a brand new V8 Mustang, a Porsche Cayman GTS, and this Alfa Romeo 4C. The keys were in the ignition. I drove them all, and found that there’s really only one word to describe the Alfa Romeo: terrifying. I was up in the forested hills of Connecticut at Lime Rock’s road course along with the rest of Jalopnik to film a couple videos and get more of the staff accustomed to driving fast and being on race tracks. Lime Rock kindly let us into one of their driver’s club (more info here if you’re interested) days. We had four hours on their 1.5 mile road course and I can’t thank them enough for it. Here’s a brief overview of how the day went for me. I went out with an instructor in the Alfa. He showed me the way around the track, and gave me some very stern advice on my driving, notably to get on the gas harder and to quit turning in too early. After that I went out with a different instructor with the Mustang, who was fine with my driving, just wanted me to quit screwing up turn one, with its bleeding off heavy braking and five-four-three downshift. After that I had free reign in the cars by myself for the rest of the four hours we had on track. I drove the E30 for more laps than I could count. I then drove the Mustang again, the Alfa again, the E30 again, and finally the Porsche. Here are some of my first thoughts on each of these cars. What blew my brain about the Mustang was how plain competent the car feels. This was a new 5.0 with a stick shift and the performance pack. It was totally composed under power, totally at ease thundering into the sweeping downhill right leading onto the main straight, calm and collected and smooth. But after driving the other, lighter cars, I got back in the Mustang and it suddenly seemed impossibly huge and heavy. I mean, it is huge and heavy, but with some context I really couldn’t notice anything but. You really needed to plan your way through the right-left-right corners leading out of the first turn on the track. If you got a bit ahead of yourself, you found yourself a bit behind the Mustang. It would rear up on its suspension, and heave over like a boat, and plow wide, and slow you way, way, way, way down. Over the top of the hill, the thing started to feel a little skittish, too. When the car got light, it got a little vague, and it danced a bit. The BMW E30 M3, loaned to us by Classic Car Club Manhattan, was the complete opposite. It’s a 1989 car with an upgraded engine, brakes, wheels, and tires, along with more I couldn’t seem to remember. Also it has a cage and five-point harnesses. What was weird was that I expected the BMW to be the scariest car. It was a genuine race car that’s only been converted back into street use, after all. Beyond that, it’s still a light, rear-drive, manual car with no ABS or traction control. Out on the track, though, it was the most reassuring car of the day. Over the hill, the M3 felt completely and utterly planted. The thing seemed set up to understeer, and I never really managed to provoke it under power. It’s an easy car. It’s easy to get your shifting right. It’s easy to pick a line through a corner. It’s easy to feed in power all the way through. I just wanted to turn lap after lap after lap. The Cayman had a similar feeling of imperviousness. It’s so much more modern than anything else I drove. The seat is electric, and it whirrs you into place in a sparkly leather cocoon. It’s an insulated experience. But the car is so, so good. As for doing car things, the Cayman does everything the best. It’s the fastest car here around the course by far. The brakes are better. The engine is more free-revving and powerful. The way it goes through a corner is unreal. The Cayman sort of shimmies. Like it’s playing a bit. It wasn’t like it was trying to spin around you (though a really sharp lift and a lot of gas did get it into one quick, broad slide), it was like the GTS only would start to rotate. It felt active and engaging. There was a sort of animal quality to it in the way the engine sounded and in the way the car seemed to have a personality. The Cayman wanted to help you. The Cayman cared. Then there was the Alfa. The first time I drove it, the 4C felt completely natural. I had driven it the day before across Manhattan and I’d taken it for the full two hour drive up to the track. I must have gotten used to the ultra-low ride and the manual steering. Even on my first few laps of the track, I didn’t even seem to notice any idiosyncrasies of the Alfa at all. It was as though the car disappeared around me as I focused on learning the track. Lifting off to come through the final bit of the big first corner never seemed to provoke the car. The mid-engine layout and the short wheelbase didn’t seem like a problem. But then I drove the other cars, and then after that I got back into the Alfa. My hands were getting sweaty, clutching on to the wheel, shimmying out of the next-to-last right hander. I’d caught a bit of curb and it was like the whole carbon-tubbed car, moving as one, bunny hopped into the entrance of the corner. I was pressing harder and that little easy lift through the first corner turned into a more pronounced lift, and the whole back end stepped out on me. And that happened again in the next corner, and that happened again in the next corner. Other drivers complained the very boosted engine (240 horsepower from 1.75 liters) didn’t give consistent response. That didn’t startle me. I was more concerned with the way the car wiggled its way into and out of the high-speed downhill bend. That’s the same corner where a guy lost it and rolled and crashed and died at last year’s historic races. It got to the point after enough snaps of oversteer into corners I decided to leave the Alfa in the pits after a few cooldown laps. I didn’t know what else I was going to get out of the car without genuinely risking a crash. Each car I tried had a very different feel when I drove it first, and when I drove it after spending some time behind the wheel of the other cars. The Mustang went from docile and composed to heavy and grunty. The E30 M3 went from shocking and alert to comfortable and capable. The Cayman went from startling and alive to fast and insulated. The Alfa had a more straightforward transformation. It started out as simple and neutral, a wonderful expression of the small, midengined sports car formula. And then the more I drove it, the more I started to get into its base character: raw. Well, that’s not quite right. It’s less what you discover about the car and more what the car exposes in you. The Alfa presents you with your flaws and your failings. It is not a living creature. It does not try and help you. It is a machine. You get a corner right or you don’t. You make it out unscathed or you crash. Lime Rock’s corners start to feel faster. The walls around the track start to look closer. If the Alfa 4C does one thing, it reminds you of the ever-present nearness of your demise. Nothing else was as direct, or as quick to expose my every error at the wheel. It roared and shook and juddered and careened its way through Lime Rock, people turning to stare as it barked by. No other car there was as involving or as exciting — that includes the E30 M3 and it includes the Cayman. 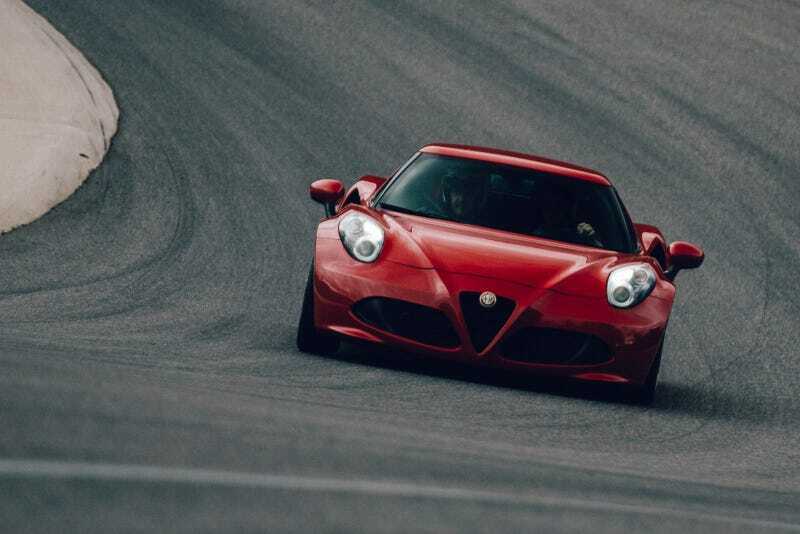 The Alfa 4C was terrifying, and I loved every second of it. Photo Credits: Dave Burnett. Check out his site PUPPYKNUCKLES, it’s seriously amazing.